Irish Hydrodata Ltd has extensive expertise in the area of wave climate assessment associated with coastal & offshore projects and with resource planning for the renewable sectors. Long term data collection and analysis studies have been completed for a number of clients. Tidal studies have been undertaken to establish local tidal patterns and to derive extremes levels for coastal works. 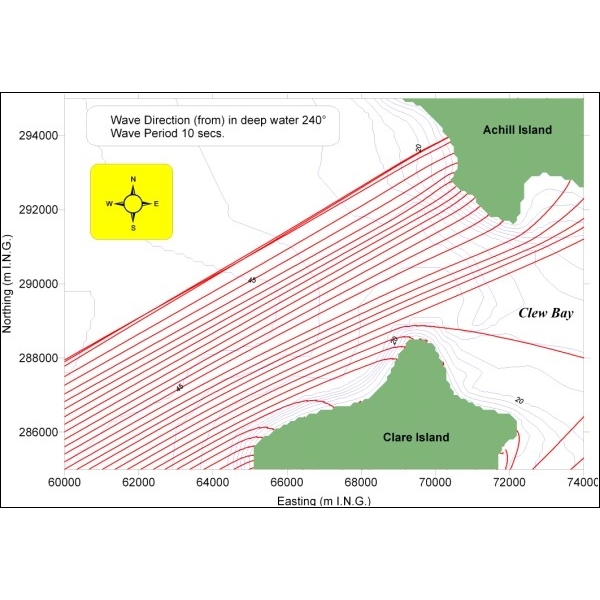 Low tide analyses are conducted to derive LAT levels for navigation and chart datum definition purposes. Our Services include: Hydrographic surveys, Bathymetric surveys, Sidescan surveys, Lunar Clocks, Magnetometer surveys, Geophysical surveys, Sub-bottom surveys, Dye surveys, Drogue surveys, Current surveys, Wave surveys, Tide surveys, Echosounding surveys, Marine Outfall Studies, Tide Tables, River Studies, Dredging & Disposal, River Studies, Facilities Planning, Shoreline & Inter-tidal Topographic Survey, Flood Level Studies, Contamination Dispersion. � 2006 - 2019 Irish Hydrodata Ltd.